I have two barns in my backyard. The “Big Barn” is the barn with the Dutch doors that you can see from the HenCam camera (and you can see the inside of it from the BarnCam and GoatCam). It’s a lovely post and beam structure, bought as a kit, and put together by the manufacturer, Country Carpenters. Instead of the standard wood floor, I had a concrete slab installed. The other barn is a small shed. Ours was custom-built, but it is similar to the prefab buildings for sale at home centers. 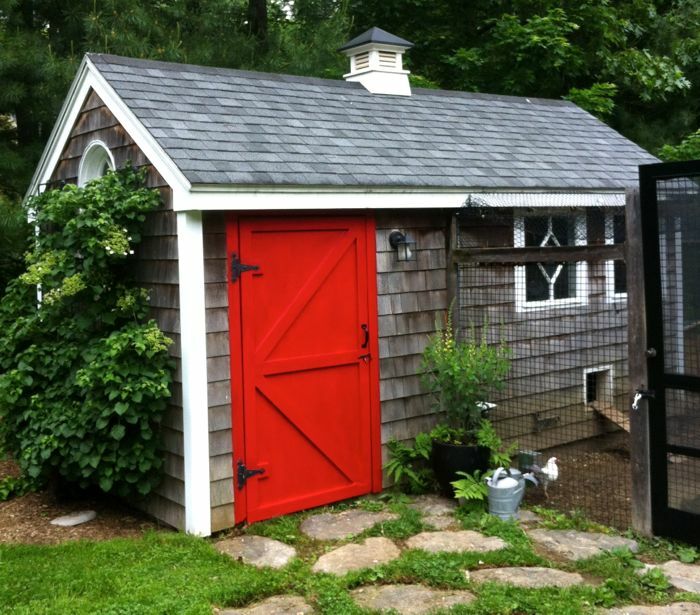 What makes this coop so charming are the salvaged windows. On one side is a 100+ year-old round window, framed by climbing hydrangea and roses. 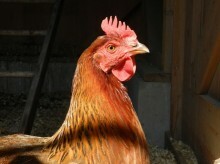 There are also two Queen Anne-style windows on hinges that let east, morning sunlight into the coop. This, too, is on a slab. I like how easy the concrete floor is to clean, and that it makes it harder for predators and vermin to get in and for parasites to lurk. Both barns have chicken pens fenced with wire. It’s installed a half-foot below the ground level to deter predators (and also to keep our burrowing bunny from tunneling out.) Hawk netting covers the run. Even with these secure measures, we close the little door to the coop at night. Raccoons and fisher cats think nothing of climbing fences, ripping off hawk netting, and taking sleeping chickens. The rabbit is also latched into her hutch at night. Inside the barn are roosts. I like ladder-style roosts with round rungs (1 to 1 1/2-inch diameter). Older and heavy breed chickens find it easier to go up a ladder. Chickens like being able to arrange themselves at different heights. Also inside are the feeder, waterer and nesting boxes. It is essential that chickens have plenty of space. Plan on 4 square feet per bird for the interior of your coop. That’s not including the boxes! Outside, your hens need 8 square feet per bird. My barns are not insulated or heated. It really isn’t necessary unless you have silkies or frizzles. What is important is that the coop has shade and is well-ventilated and yet draft-free. Make sure that you have windows that open, and soffits and vents in the eaves. If you can, install a working cupola. 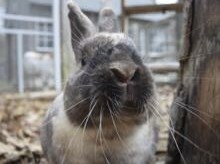 Because the rabbit overheats easily in the summer, a special 8 x 8 foot piece of shade material is stretched over her hutch. The chickens appreciate this shade, too, as most of the yard is in full-sun. 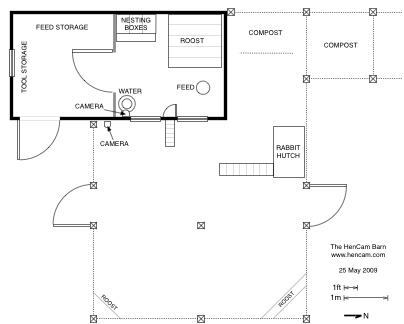 Below is a plan of the HenCam coop. It is just the right size for our hens and bunny. Perhaps this will inspire you! Click on the image to get a higher resolution PDF file.